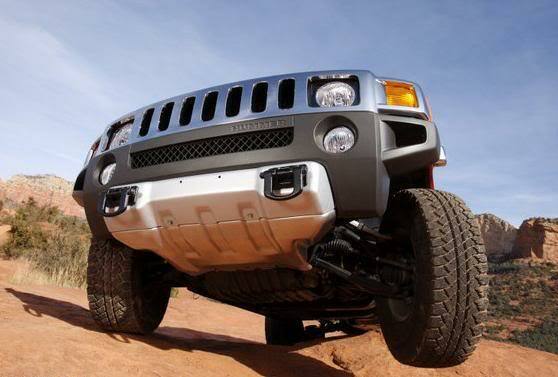 Here is a pic of the new lower front bumper of the 2008 H3. This pic is also buried in another thread, but I thought it was worth reposting here. I prefer the black IMO. I visited the dealer the other day and saw them. It's looks very out of place on the H3. I'd have to break out the fizz can if I had a 2008. The silver doesn't seem to fit right with the H3. Yeah. I can't decide whether I like it or not. I'll wait a while before doing anything, and see if it grows on me. I was at the Hummer Dealership today and the salesmens and technicians were saying they didn't like the bumper being silver as we all looked at the Alpha. The silver front does look different - maybe I'll get used to it. But why the heck did they get rid of the stamped H3 logo on the underside of the skidplate? I'm not a fan of the silver, and I rather liked the stamped H3 logo that's on the older models.